Body Image Series, Part 6: What is the healthy way? April 2012 – There are so many fad diets out there. I would love to do this fast! Right now! But I’m not sure that’s the most healthy way. And I’m also not sure it would stick anyway. So, the plan is limit the calories, increase the exercise. That’s pretty straightforward, right? I have a food/calories diary and exercise log. I’ll give it a try for 4 weeks and see how it goes! Well … there it all is in black and white! No more starving, vomiting, or binge eating. Got it, nerves? It’s my turn to control you — not the other way around. Down with the comfort foods! More carrots! And crying no longer counts as exercise! I’m getting my fanny to the gym 3 times a week, minimum. Plus, how GORGEOUS is the weather right now! I can totally walk outside a few times a week this time of year. That’s it! I’m committing! How many times have I done this? Seriously? How many? I’m sad to say … more than I can count. And guess what? I was on the right track this time. Sort of. I was right: Miracle diets and quick cures just don’t cut it. They’re typically not healthy, and most of the time they don’t stick. But you know what? That’s only half the puzzle. Eventually I did find the healthy way! It’s not a miracle, though. And it’s not quick. It’s a life-change: physically and mentally. And I’ve learned if I want to be healthy–I mean, really healthy–I’m going to have to stick with my new paradigm for the rest of my life. For someone like me who suffers from chronic migraines, is missing half a pancreas, and has the genes for diabetes–among other things on a long, boring list–it’s totally worth it. 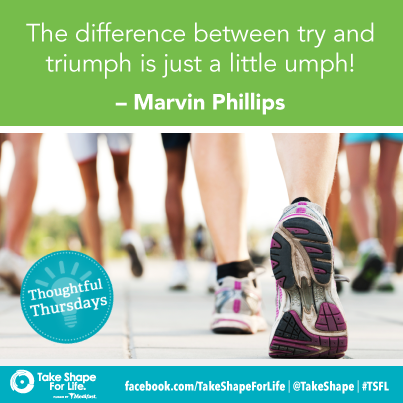 About a year ago I came across a program called Take Shape for Life (TSFL). It’s not a diet. It’s not a weight-loss plan (unless you need it to include that facet). For me, it felt more like a college class on ‘how to be healthy.’ I spent months poring over my ‘textbook,’ Dr. A’s Habits of Health, and doing exercises in the accompanying workbook. I whined and cheered and complained and celebrated with my private health coach, Suzanne, once a week (or more if I needed her) and didn’t pay a penny for her services. Best of all, I finally caught the vision. The whole picture. Being healthy isn’t just about diet and exercise. It isn’t about how you look, how much you weigh, or what size pants you wear. It’s about how you feel. It’s about transforming your bod into a well-oiled machine. And it’s all about what you want to accomplish with that well-oiled machine. What are your dreams and life goals? Want to ski more? Want to break the diabetes cycle in your family? Want to play with your grandchildren without getting winded? Just want to make it through that 45 min. aerobics class without collapsing at the end? These are the things we shoot for in TSFL. Of course, eating right and exercising will help us reach some of these end goals, and the program takes that into account. But I’ve also learned about how sleep, water, friends, and stress affect my health–among many other things. For the first time, I have a well-rounded understanding of how to keep my body healthy. It’s really cool. I know different things work for different people. I’ve also heard there are other programs out there that take a well-rounded approach. What’s worked for you? Next Post Body Image Series, Conclusion: So, what am I supposed to look like?